Canadian company Aliments Fontaine Santé Inc., in cooperation with the CFIA, has recently recalled certain batches of Fontaine Santé “Sal-Couscous Royale.” The product is believed to be contaminated by the bacteria Listeria monocytogenes. Listeria monocytogene is a common bacterial contaminant in food. These harmful bacteria can cause food poisoning or infection known as Listeriosis. Common symptoms of this infection include fever, diarrhea and nausea. In pregnant women, Listeriosis can cause stillbirths or miscarriages. In people with weak immune systems, this bacterial infection can lead to more serious medical conditions, even death. 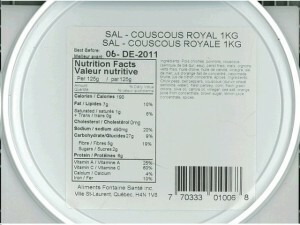 The recalled product, which is also known as the “royal couscous salad,” were sold in 1-kg containers having a UPC code of 770333010068. The ‘best before’ date indicated on the container is “06 DE 2011.” The affected product was distributed and sold in different retail stores in Ontario and Quebec. However, there is also a possibility that the product was distributed all throughout Canada. The product was also sold in clerk-served deli-counters, where it was sold in different weight containers. Some of these containers may bear a label and some may not. Consumers who may have bought the product with any date from November 17 to December 1 should check with the store that they bought it from to learn whether the product they bought is part of the recall. Consumers who have concerns about the product and the recall can call the manufacturer at 1 888 627 6283, extension 234. They may also call the CFIA hotline at 1 800 442 2342.